The least-invasive type of veneers is Lumineers. These veneers “snap” onto the tooth instead of cap the tooth, so there is no pain and no need for anesthetic injections or filling down of the tooth to make room for the veneer cap. Unlike ordinary veneers, which require the preparation of the teeth first before they can be applied, the application of Lumineers requires only two steps. 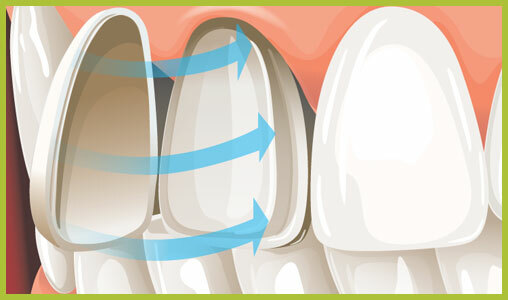 First, a mold of your teeth will be taken so that the veneers will fit perfectly. They will also be colored match your natural teeth, or you can request them to be whiter and brighter. The second step is just having them applied, which as we mentioned before is quick and painless. Since there is no need to file your teeth down first, there is also no need for the middle visit, where your teeth are prepared. Lumineers save you from discomfort, pain, and an extra trip to the dentist.